Disclaimer: For each sale that is made through the purchase links in this post I get a small commission (that does not affect your final purchase price!). Of course, I'd love if you bought this book through these links, but I have tried my best to make my review faithful. I don't want anyone to come later at me and say they were tricked into buying the book and the review was unfaithful to the book. Anyway, I won't get rich quickly (probably not even slowly) by these sales, but they will work the normal upkeep of this blog. As you may guess from my previous post about bests blog posts I have read recently, I read a few self-improvement blogs. I'm more for the time-management and general tips than for other self-improvement stuff, but sometimes the advice they give in other areas can be interesting. And this book covers both areas. 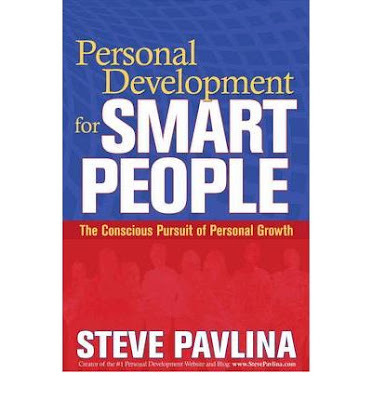 I came to Steve Pavlina's blog a few years ago via StumbleUpon (to this article, if I remember correctly) and started to read it from then on. And when I got the chance to pick his book, I did. Good book. Worth the money. I really love the way this book starts. It begins with a short biography and how he came into self-development. From ther he goes on how he came to write a book on self-development. Steve splits one's being in 3 principles: truth, love and power. And from four combinations of these three pillars, oneness (truth+love), courage (love+power), intelligence (truth+power+love), and authority (truth+power). He found these principles and combinations using a 'mathematical' approach, requiring them to satisfy constraints (being universal, complete...) and be applicable in real life. Good idea and good results. If you wonder why I copied verbatim this list here, read it again. It is a fantastic list on life areas, covering anything. Read it again. See? This self-assessment helps with filling your life with Truth. One of the parts that touched me the most in the Truth chapter (besides this list) was about Journaling. For Steve, journaling comes as a free flow of text out of your head, with goal-setting and problem solving intertwined. You can see it here in his blog. The seeds of that journaling eventually grew in my life bookmarking approach, which is not real journaling, but is exactly what I need. Next chapter is Power. Did you guess? This chapter also talks about goals. And the best point I saw is: do not relate goals to suffering. The goal setting process is usually as follows: you want to do something, you set a goal, you reach that goal. The problem is, the moment you are setting the goal, you are already thinking of what the struggles and hardness you have ahead. And you start to relate goals with suffering. When you set a goal, focus on the present moment. Power is also the foundation of motivation and self-discipline. When you are moving, your motivation is high but when you stop your motivation fades. If you can get enough discipline to start rolling again, there you go! Use self-discipline to start rolling and then move with motivation. It is like riding a bicycle. Pedal with self-discipline and move along with motivation. To raise power in your life, you have to keep challenging you. Raise the bar a little each day. The best example is for work. Do you work your entire 8 hours? Probably no. Maybe you don't want to. If you do... Start with what you can (even 30 minutes) and raise it daily. You can read his ideas here, and my ideas on (micro) time management here. Another good advice comes from the chapter titled Authority, and is about failure. When you start a new endeavour you may feel frightened by the fear of failure. What you have to keep in mind is that failure is to be expected, but also improvement over time, because you have already been there with something else. And from Authority comes Persistence... Which is for me another way to talk about continuous improvement. After the first 7 initial introductory chapters comes another self-assessment, more complex and embracing these first chapters. Roughly 6 questions for each chapter. Then a plan on how to improve yourself in these subjects. After this first part comes the real world application of these principles. This is where the real deal comes, but you need the introductory chapters first, around 130 pages. Don't expect to skim right here. This book offers an interesting view of self-improvement. His principle-based approach, and how he came to them is very interesting, as are the results. All in all, this is a good book. Most of the content is already available in his blog, and you can get a good view of his opinions and writing there. Just beware, this book was published in 2008 and his ideas and blogging style have changed quite a bit. Amazon.com : You already know Amazon... You can buy more stuff there, but no free international shipping. Amazon Kindle : You can also buy the book for your kindle device. Don't have a kindle? Buy it here!